I have been a little obsessed with pears this fall. It’s funny because usually in the fall I want to bake with apples and pumpkins, forgetting about pears altogether. But this year it is all about the pears and I am loving it. 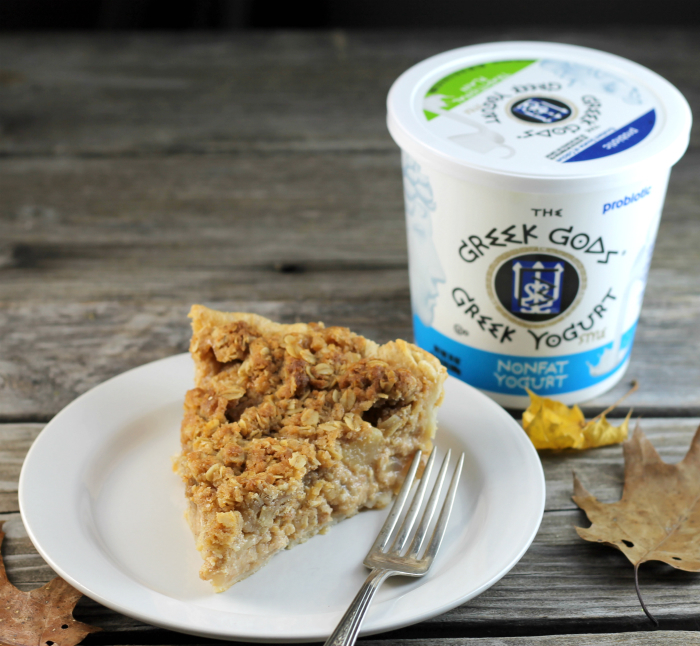 So when I received an email from The Greek Gods® Greek-Style Yogurt with the challenge of making an irresistible pie, my first thought was a Greek yogurt pear pie. I knew that the combination of the two would be a match made in heaven. Wow was I right!! To tell the truth, I was a bit nervous about the pie and all. I guess as many of us are, I am my own worst critic. So I had a little taste test with some of the best pie makers I know; my mom and my sister. Sundays are a gathering time at my mom’s house. Mike and I usually stop by, as well as some of my siblings and their spouses. My mom is one of the best pie makers that I know. 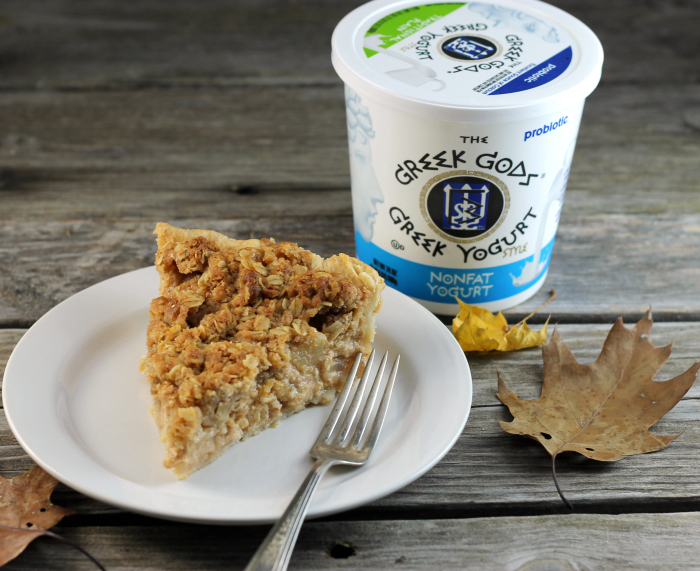 She has been making pies for many many years and I knew if she liked it, that it would be good enough to submit for this blog post featuring The Greek Gods® Greek-Style Yogurt. Well, you guessed it; yes it passed the test with my mom and sister. They both thought it would be a good addition to my blog. The Greek yogurt and orange juice creates a custard-like mixture which goes lovely with the pears in this pie. 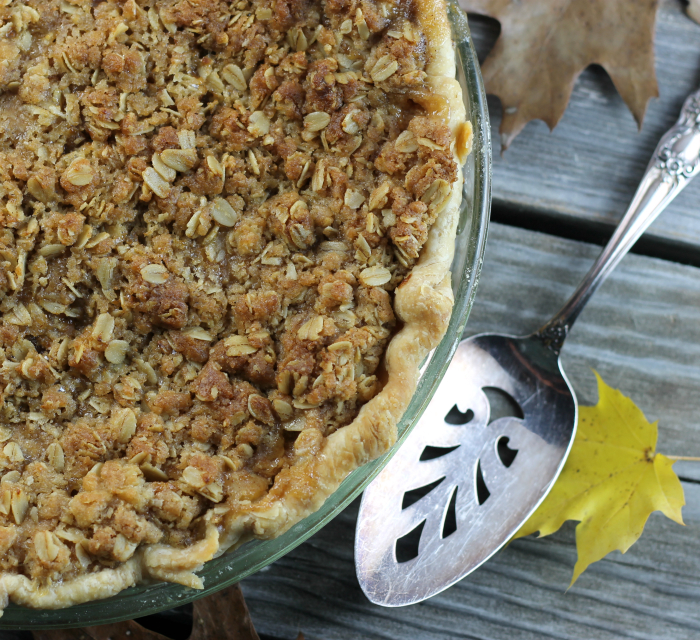 In my book, a crunchy crumble topping is a must on this type of pie. Oh and I can’t forget the cinnamon and cardamom for the flavoring, which is another must when we are talking pear pie. So I hope that you will give The Greek Gods® brand Greek-Style Yogurt a try. The Greek Gods® brand Greek-Style Yogurt is gluten-free and contains live and active cultures. Plus, The Greek Gods® brand Greek-Style Yogurt is made with milk from cows that are not treated with growth hormones. You can learn more about The Greek Gods® Greek Yogurt at their website www.greekgodsyogurt.com or follow them on Facebook here. 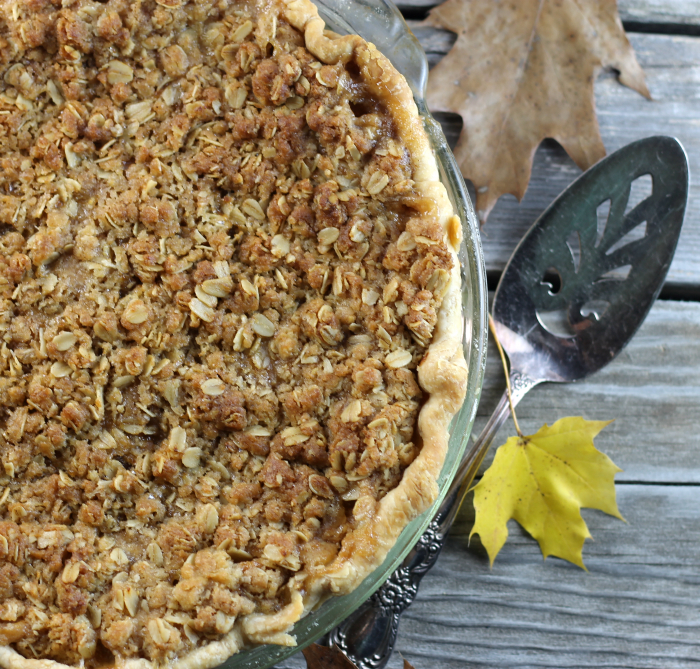 Preheat oven to 375 degrees F. Place the pie crust in a 9-inch or larger pie pan and set aside. Peel and slice pears into small pieces. Sift together the sugar, flour, cinnamon, and cardamom, add to the pears and mix until well blended. Mix The Greek Gods (R) yogurt, orange juice, and egg together add to the pears and mix until it is mixed well. Pour the mixture in the pie pan and place in the preheated oven. Bake for 30 Minutes. 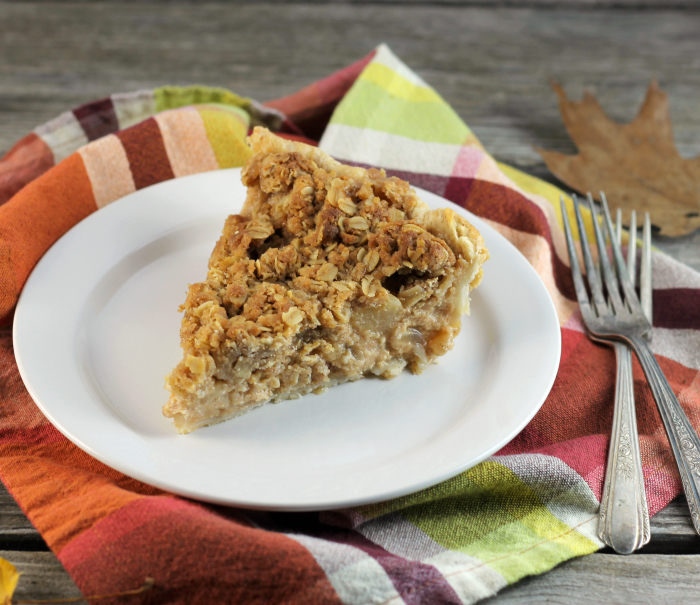 While the pie is baking for the first 30 minutes assemble the crumble for the top. Add the sugars (if you prefer you can use all brown sugar for the topping), flour, cinnamon, and oats and mix well. Add the soften butter and with a fork cut the butter into the oats mixture until they are well mixed. After the pie is baked for the 30 minutes remove from the oven and sprinkle the topping evenly over the top of the pie. Place the pie back into the oven and continue to bake for another 30 minutes. Remove from the oven and set on cooling rack. Can be served with a scoop of vanilla ice cream. Looks like you’ve got it to hold together well. Good on you. 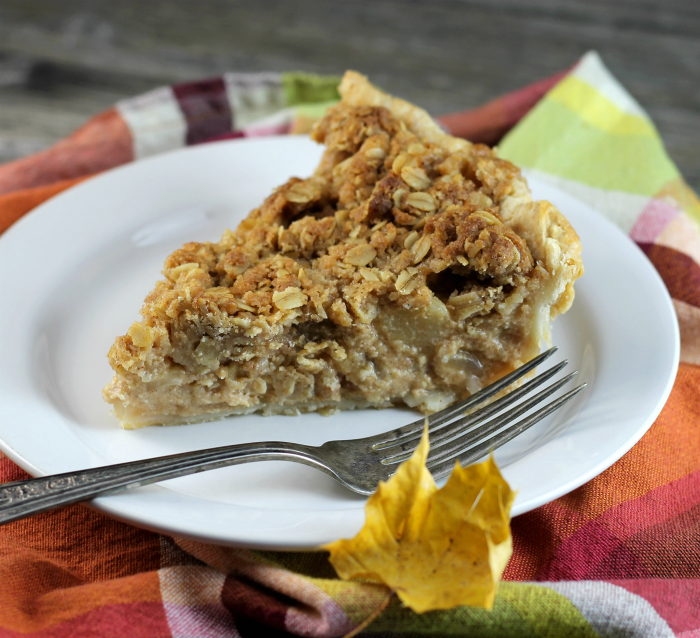 Love the addition of oatmeal in the streusal topping too! Oooh with the cardamom, orange juice and pear filling and that cinnamon topping, this pie is irresistible – such a brilliant idea to use Greek yogurt in it! Wow this looks so good! I think I’ll have to make this for the holidays 🙂 I’m experimenting with Greek yogurt on my blog this week, so I may even have to do a holiday test run with all my leftover yogurt! Hi Louise, thank you for stopping by. How are you doing? I love anything with crumble topping! This looks fantastic! Pear and apple desserts are my favorite right now, this looks moist and delicious! That pie looks divine! I can imagine having it for breakfast. Yum!